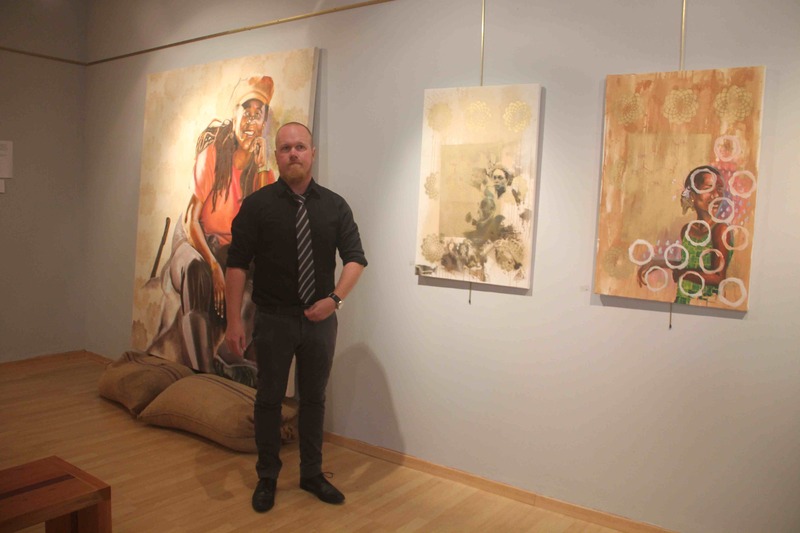 Asher Mains opened his Society:Cocoa exhibition at the Susan Mains Gallery. It was a sizzling affair. Cast of the Urias Peters’ play “Struggle” performing. Click to see video of performance by “Struggle” cast. For centuries people and societies have sought after gold. For personal wealth and for the stability of society the pursuit of gold is a large chapter in the history of the Western world. Even today, the gold standard backs some of the world’s currency. When gold could not be found, medieval alchemists tried to create gold through the combination of different elements. Coincidentally, in the pre-Columbian “New World” cocoa had long been used not only for its important role as a drink but also as currency. In this way, the pre-Columbian harvesters of cocoa were truly creating their gold out of the ground. James Elkins makes the connection between alchemists who pursue their work, largely intuitively and looking in places for materials that haven’t been tried yet to the work of an artist. Artists traditionally use materials and pigments that are derived from the natural world in order to create a composition that reads as “gold” in front of the viewer. 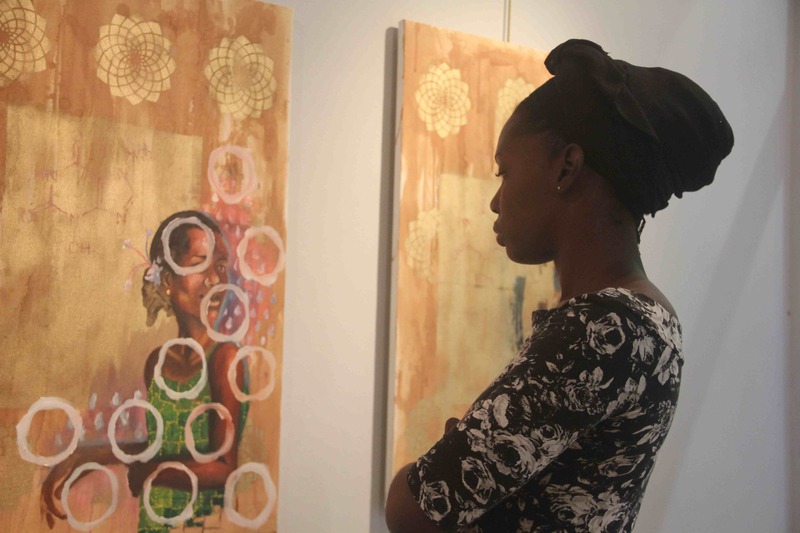 Artists and cocoa farmers share an alchemical relationship. While cocoa itself is not used as currency, in our society it is a source of income and pride. Grenada’s soil produces the gold standard of chocolate in the world. It is with these ideas that I propose these new works under the title, “Society: Cocoa”. Imagine a society that celebrates its true alchemists. Whether artists or farmers, there are people among us who create beauty, value and significance out of the ground. While the West celebrates and values currency and people who are able to deftly move it from one place to another, I propose we celebrate and value society’s producers and creators. In the scope of this exhibit, I propose a society where cocoa farmers are the celebrities and the individuals on which society it built and relies. The role of art should be to heighten our engagement with our reality and our environment. Ultimately the role of artists is to pursue the fullness of life beyond the status quo in order to be the most complete version of our selves as possible. In this way, not only is the practice of creating art objects an alchemical endeavour but also our lives themselves are raw material from which we strive to convert into gold. I am encouraged to report that this show is not a fantasy, but rather an observation; a recognition that our society is full of unsung heroes, hard workers, alchemists and people that are not given credit for their contribution to society. 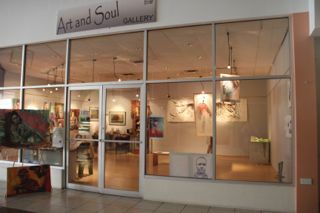 I had the pleasure of seeing some of these paintings first hans at a gallery in Spiceland Mall, Grenada this month. I also remember Mott Green from Trevor McDonald’s ‘Secret Caribbean’ documentary DVD – and always thought what a humble man he was – living in his factory and sleeping like a student there – no frills, now vulgar displays of wealth, just a nice down to earth man with a passion and good heart.